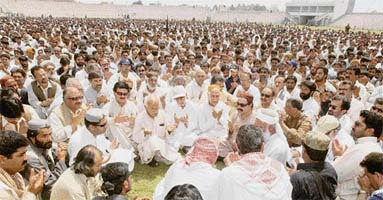 Movement of all trains towards Baluchistan, and particularly to capital Quetta from other parts of Pakistan has been suspended in the wake of more reports of mayhem in the tribal province following the death of Baluch leader Akbar Khan Bugti in a military operation in the Kohlu Hills. Should Darrell Hair continue umpiring in cricket matches at the top level? Eesha Sharma had carried toxic lead in her bloodstream for years. But she had no idea the lethal heavy metal – found in generous quantities in the groundwater around Transport Nagar where she lives – was eroding her health till she landed in the ICU of Dayanand Medical College. 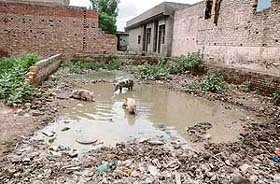 Pigs thrive in residential areas of Gopal Nagar in Haibowal where public sewerage pipes have been lying blocked for over two months. With an eye on the forthcoming Assembly election in Punjab, Prime Minister Manmohan Singh recently reviewed the progress of infrastructure projects and directed the state and central ministers to speed up their implementation. The Chief Minister, Mr Ghulam Nabi Azad, today expanded his Cabinet by inducting nine more ministers, taking its total strength to 22. One of his ministers of state was elevated to the Cabinet rank. India and Iran today re-explored each other, but New Delhi failed to extract an assurance from Tehran for honouring the $ 25 billion LNG deal the two countries had signed in June 2005. Whoever wants to harm Pakistan nationally or internationally would have to fight with me first. As many as 26 persons, including 12 women and eight children, were swept away in the Krishna today when the minibus in which they were travelling plunged into the river after crashing against the railing of bridge. The Centre today told the Supreme Court that it was trying to evolve a consensus among political parties on the issue of providing an “iron curtain” security ring to the makeshift Ram temple at Ayodhya with a view to making its protection foolproof. The Human Resource department of The Tribune has been awarded the “HR Excellence Award” by the Amity International Business School, Noida. The award has been awarded based on result of the research conducted at the Amity International Business School. Literally, it’s a man’s world in this part of Haryana. In Gangateri and surrounding villages of Popra, Jhimri Khera, Jogi Khera and Kol Khera of Asandh block in the heart of Jatland, the sight of a girl child or a young woman is indeed a rare event. 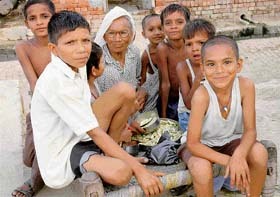 Mrs Shanti Devi of Popra has seven grandsons and no granddaughter. This is one of the many families who have no daughters.